The Udocx transaction log can be used for basic troubleshooting and to audit your organization's use of Udocx applications. The transaction log may be exported in .CSV format (comma separate values) and viewed in any standard spreadsheet application such as Microsoft Excel. 1.Go to the Udocx administrator portal. And login with your admin account. 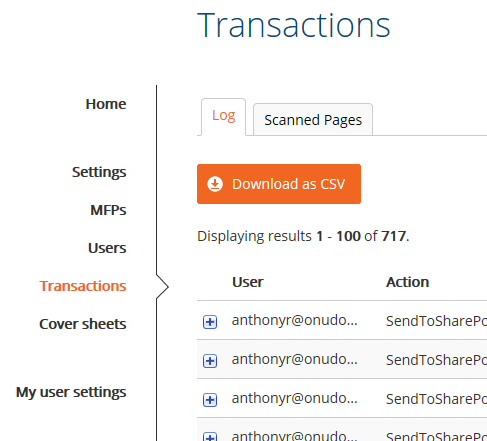 2.Select 'Transactions' from the left pane and press the [Download as CSV] button. 3.Press [save] and store the CSV on your local drive.